A Tusken Raider is a Star Wars minifigure introduced in 2002. 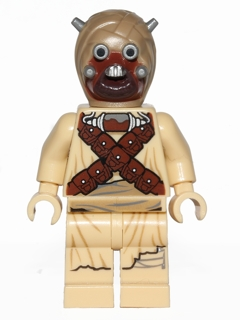 The Tusken Raider minifigures which appeared in the set 7113 Tusken Raider Encounter each had a black gun as an accessory. Tusken Raiders have appeared as enemies in all five released LEGO Star Wars video games on levels set on Tatooine. The video game model appears to be based off the physical Minifigure. "Tusken Raider" is a playable character in Free Play in LEGO Star Wars II: The Original Trilogy and LEGO Star Wars: The Complete Saga, with their weapon being a gun. The Tusken Raider is also playable in the LEGO Star Wars III: The Clone Wars as a minikit character; you have to acquire all ten minikits in the bonus level Hostage Crisis. Tusken Raiders, also known as Sand People, were a nomadic sentient species native to the planet of Tatooine. Tusken Raiders were often hostile to others who inhabited the planet. In the year 22 BBY, a clan of Tuskens captured Anakin Skywalker's mother, Shmi. Anakin went to Tatooine to rescue her from the Tuskens, arriving to see his mother one last time before she succumbed to her injuries. Anakin then proceeded to strike down the group of Tusken Raiders who captured Shmi. Many years later, his son, Luke Skywalker, encountered a Tusken Raider that attacked him. Obi-Wan Kenobi appeared and used a Jedi mind trick on the Raiders who were scavenging Luke's landspeeder. Thinking they were hearing a Krayt dragon, they quickly left. This is a description taken from LEGO.com. Please do not modify it. (visit this item's product page) Also known as Sand People, Tusken Raiders are tribal nomads who live on the desert world of Tatooine. Extremely hostile to outsiders, they cover themselves in robes and wrappings, and use special masks and lenses to survive in the harsh environment. This page was last edited on 7 July 2017, at 09:17.